Stoke City manager Mark Hughes says he has no plans to spend in the January transfer window unless the Potters' injury woes worsen. 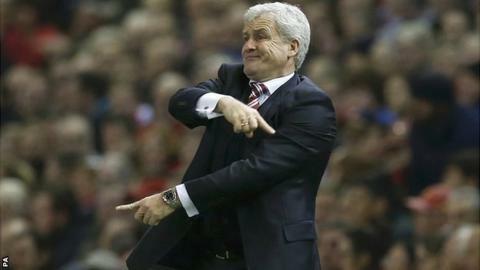 Hughes has had to prepare for Tuesday's trip to Manchester United without five injured first-team players. But he told BBC Radio Stoke: "It's part and parcel of a hard Premier League campaign that, at some point, you lose players through injuries or suspension. "It's unlikely we'll spend a significant amount in the window." On top of the loss of defender Robert Huth (calf) and strikers Peter Odemwingie (knee) and on-loan Victor Moses (thigh), Hughes has this week suffered a double blow in midfield. Steve Sidwell will be out for six weeks after suffering a grade two tear in his medial knee ligament, while Glenn Whelan suffered a calf muscle injury on his comeback in Saturday's 1-0 defeat by Liverpool at Anfield. But Hughes said that the Potters already have the necessary strength in depth to avoid having to recruit when the transfer window reopens in the New Year. "We'd only go in if we got stretched," he said. "If, in January, we lose any to long-term injuries then, if the right player became available, I'm sure there'd be resources available. "If it continues, we're going to have to make sure we're not exposed and don't leave ourselves too open. We want it to resolve itself and, in the given time, we'll be able to welcome players back."